Professional Business Cards is an asset for any professional. It should be promotive and informative but must have something that will prevent to throw away. As good quality Professional Business Cards can cost a huge, you might consider two lines of cards – one is just an usual version and second one is based on these tips. At a time when communication is increasingly oriented towards the digital business cards, still the need of fully traditional professional business cards can never be ignored. Here are some tips for business cards that make you want to look, and especially that the recipient keeps for long or express something fine. Its a half battle win from marketing part. The standard size of a business card is 8.5 cm X 5.4 cm. This format is certainly the most common, but there are also the small versions. It corresponds to the size of a credit card and will be conducive to fit into any wallet. Avoid: too large card will not be retained, it will bent, lost or discarded as not fitting within the vast majority of wallets and card holders. Vertical or horizontal direction does not matter. A horizontal card allows you to organize information on the right and left of it. A vertical card requires to have its data under each other. However, most of our everyday cards is of horizontal format, it remains the most natural and is a reference. Do not: Make a horizontal front and with a vertical reverse side. Quality of paper will give a good image of your company, choose a coated paper, glossy or matte with a thickness of 300g to a minimum to ensure a good performance of the card. For more institutional activity such as a lawyer, doctors, your choice can move towards a textured paper. Avoid – The papers which are cheap or too thin. Avoid: If you opt for filming, you can not write on your cards! Your card is not an advertisement, go only for the essentials. Today, there are many options available to embellish your cards so you stand out from the competition. For example it is possible to print on different paper types like transparent, chrome, silver, gold, grainy but we must keep in mind that your card should quickly learn about its owner and not cause confusion. If you do not feel the soul of a seasoned designer, be aware that a single card but the information is well organized, will always have more impact than a card too complex to disrupt the final user. Do not make a business card that looks like a tag. This Article Has Been Shared 2996 Times! Profile Images are important not only for your eyes only, it is important as Google Web Search and others shows up your profile image with the search results. 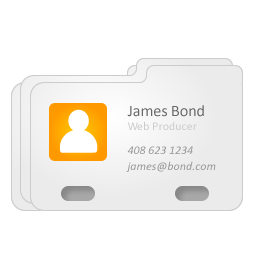 Cite this article as: Abhishek Ghosh, "Professional Business Cards : People Will Keep Your Card," in The Customize Windows, March 2, 2013, April 19, 2019, https://thecustomizewindows.com/2013/03/professional-business-cards-people-will-keep-your-card/.